Make Every Minute Count with Comprehensive Pre-K Curriculum! Opening the World of Learning is a comprehensive pre-K curriculum, equitable in English and Spanish, that is built upon a foundation of critical content area concept development. OWL prepares children for Kindergarten with ongoing assessment of research-based success predictors and playful, purposeful, and personalized instruction. The literature ties to the concepts and vocabulary. 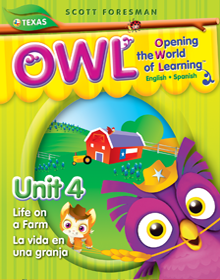 OWL also provides daily English Language development lessons designed to support English Language Learners. These lessons are tied to the key concepts and vocabulary of the day’s instruction. All parts of the day are used as opportunities for learning. While planning and implementing each part of the day, teachers are encouraged to be intentional in their actions and words. This intentionality and the intense focus on conversation provide an unprecedented amount of implicit and explicit oral language, critical thinking, and vocabulary instruction. Through the use of essential questions, teachers help children connect content to their experiences, which takes them beyond rote learning and leads to thoughtful, reflective learning. Please contact your AGM for more information.